China wants to put a solar power station in orbit by 2050 and is building a test facility to find the best way to send power to the ground. As the green enery revolution accelerates, solar farms have become a familiar sight across the nation and around the world. But China is taking solar power to a whole new level. The nation has announced plans to put a solar power station in orbit by 2050, a feat that would make it the first nation to harness the sun’s energy in space and beam it to Earth. Since the sun always shines in space, space-based solar power is seen as a uniquely reliable source of renewable energy. 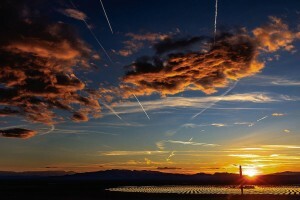 “You don’t have to deal with the day and night cycle, and you don’t have to deal with clouds or seasons, so you end up having eight to nine times more power available to you,” said Ali Hajimiri, a professor of electrical engineering at the California Institute of Technology and director of the university’s Space Solar Power Project. Of course, developing the hardware needed to capture and transmit the solar power, and launching the system into space, will be difficult and costly. But China is moving forward: The nation is building a test facility in the southwestern city of Chongqing to determine the best way to transmit solar power from orbit to the ground, the China Daily reported. thought to be too complex. But with advances in wireless transmission and improvements in the design and efficiency of photovoltaic cells, that seems to be changing. “We’re seeing a bit of a resurgence now, and it’s probably because the ability to make this happen is there, thanks to new technologies,” said John Mankins, a physicist who spearheaded NASA efforts in the field in the 1990s before the space agency abandoned the research. Population growth may be another factor driving the renewed interest in space-based solar power, according to Mankins. With the world population expected to swell to 9 billion by 2050, experts say it could become a key way to meet global energy demands — particularly in Japan, northern Europe and other parts of the world that aren’t especially sunny. 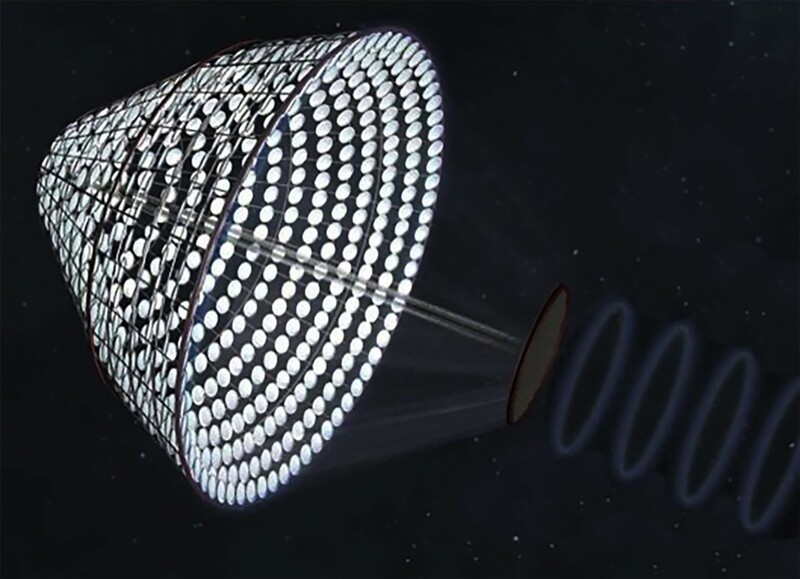 Details of China’s plans have not been made public, but Mankins says one way to harness solar power in space would be to launch tens of thousands of “solar satellites” that would link up to form an enormous cone-shaped structure that orbits about 22,000 miles above Earth. ground-based receivers — giant wire nets measuring up to four miles across. These could be installed over lakes or across deserts or farmland. Mankins estimates that such a solar facility could generate a steady flow of 2,000 gigawatts of power. 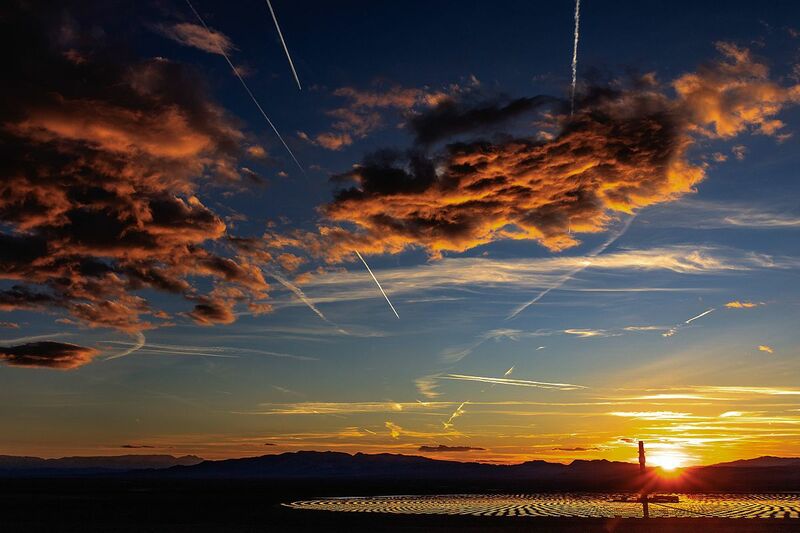 The largest terrestrial solar farms generate only about 1.8 gigawatts. If that sounds promising, experts caution that there are still plenty of hurdles that must be overcome — including finding a way to reduce the weight of the solar panels. For its part, the Caltech team recently built a pair of ultralight photovoltaic tile prototypes and showed that they can collect and wirelessly transmit 10 gigahertz of power. Gdoutos said the prototypes successfully performed all the functions that real solar satellites would need to do in space, and that he and his colleagues are now exploring ways to further reduce the weight of the tiles. China hasn’t revealed how much it’s spending to develop its solar power stations. Mankins said that even a small-scale test to demonstrate the various technologies would likely cost at least $150 million, adding that the swarming solar satellites he envisions would cost about $10 billion apiece. Despite its exorbitant price tag, Mankins remains a staunch advocate of space-based solar power. Grand Ridge, an existing Invenergy project that combines wind power and energy storage, in Illinois. Image: Invenergy. The US state of Iowa got its first grid-scale solar-plus-storage system at the beginning of this year, and this has already been followed by the completion of another, larger battery project in the US state this week. Energy-Storage.news reported last week on the completion of a solar PV system at Maharishi University of Management equipped not only with solar trackers but also with a 1.05MWh flow battery. This week, project developer Invenergy said a four month “construction sprint” had been successfully undertaken and the company has begun commercial operations of a 1MW / 4MWh lithium iron phosphate battery energy storage system. Located at a substation in Knoxville, Iowa, the project has been executed for utility MidAmerican Energy, one of billionaire investor Warren Buffet’s companies as a subsidiary of Berkshire Hathaway Energy. MidAmerican serves just under 800,000 electricity customers. 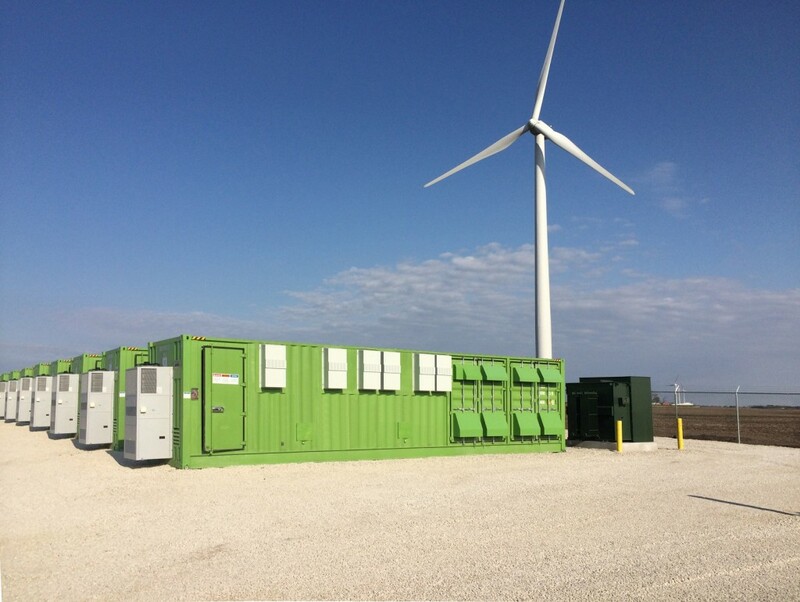 In a November press release, MidAmerican’s VP of resource development said the utility-scale storage system would teach lessons about “how best to use an energy storage system, and how it can serve our customers in the future,” adding that the primary purpose of the system will be to help manage peak loads on the utility’s network. “Energy storage has the potential to allow us to retain energy when customer demand is low and release it during peak usage times. That would give us new options to manage peak loads, enhance overall reliability and help keep electric costs low and affordable for our customers,” Mike Fehr of MidAmerican Energy said. The utility highlighted four of the main benefits of energy storage that it will explore through the application of the lithium system: flattening and managing peaks in electricity demand through storing off-peak energy for later use, reducing the required run times and capacities of natural gas peaker plants with energy storage, enhancing the value and usefulness of renewable energy through smoothing the output of solar farms before it enters the grid and improving power quality and extending the life of transformers and other grid infrastructure. 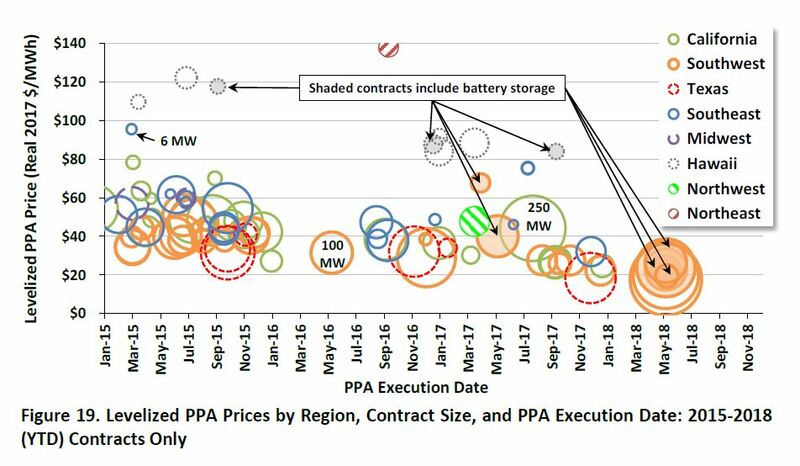 “Energy storage is still in the development stages and the economic feasibility on a larger scale is being assessed as well; however, prices are trending downward,” Mike Fehr said. For Invenergy, which already owns and operates four other large-scale battery systems it developed, this has been its first project as an EPC (engineering, procurement and construction) partner. “We are excited by the new opportunities for battery storage that we are seeing around the country. We are grateful for partners like MidAmerican Energy who are seeking innovative ways to deliver value to their customers and are proud to have provided them with this solution in such a short time,” Invenergy senior VP Kris Zadlo said. Solar power is growing faster than any other renewable energy in the world, according to new research by the IEA. But where in the world is the technology booming the most? Solar is growing at speed in several states, including Utah, Arizona, and Nevada, and looks set to continue this trend through this year and beyond. In 2016, solar power was the fastest growing source of new energy globally, accounting for up to two thirds of new power capacity added, according to the International Energy Agency (IEA). This was in part due to China embracing the technology, which represented half of all new solar panels. 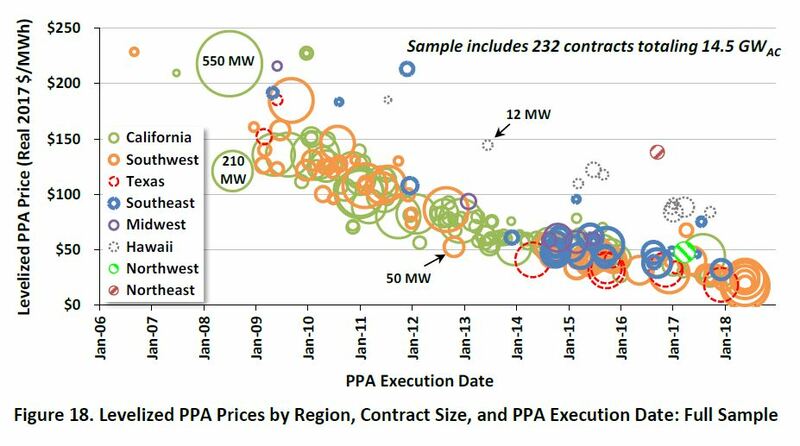 The dramatic increase has allowed the IEA to raise its predictions of renewable capacity growth by 12% from 2015, and the agency advises that growth could potentially reach 27% if enhanced policies addressing regulatory uncertainties and grid integration are implemented. Falling prices and government policies are the main reasons for the increase, but why has solar taken off more quickly in some countries and states than in others? Australia has an awesome solar resource, which it has only recently begun to take advantage of with analysts predicting that solar energy capacity in Australia could double this year alone. In January, 111MW of new rooftop solar panels were installed, a 69% increase from last year. Meanwhile, 30 industrial-scale solar power plants are scheduled to come online throughout the year with more projects due to be approved. These large-scale projects are expected to add 2.5GW and 3.5GW to the Australian grid, while rooftop solar will add around 1.3GW. These will vastly increase the percentage of solar in the energy mix, with current resources at just 7GW. The solar boom is expected to grow further, as prices continue to drop and it becomes more accessible. This boom has also been supported by Tesla’s 100MW battery in South Australia. The technology has been extremely successful, responding to power outages in milliseconds during the summer and easing power demand. China has had one of the most dramatic switches to renewable energy. From 2013 more than half of China’s capacity additions have been from renewable or nuclear sources, as the country tries to reduce its reliance on coal and tackle air pollution. Today, China has the biggest solar market in the world after adding 34GW of power in 2016, double the amount added in the US. It is also home to the leading solar power farm at present, Longyangxia Dam Solar Park, along with a major floating solar plant, located in Huainan, Anhui Province. This is only the start, with investments in greater and better projects seemingly unending and 8MW of solar already added in the first quarter of this year. However, despite huge growth, solar still only accounts for 1% of China’s energy mix, with 66% still met by coal. By 2050, this is expected to be a vastly different picture with some government predictions suggesting that 86% of demand will be met by renewables, and a third of that made up of solar. Following the election of President Trump, many industry experts were sceptical about the role renewables would play in the US energy sector, due to his policies favouring coal and natural gas, and suggestions of redistributing funds away from environmental technologies. 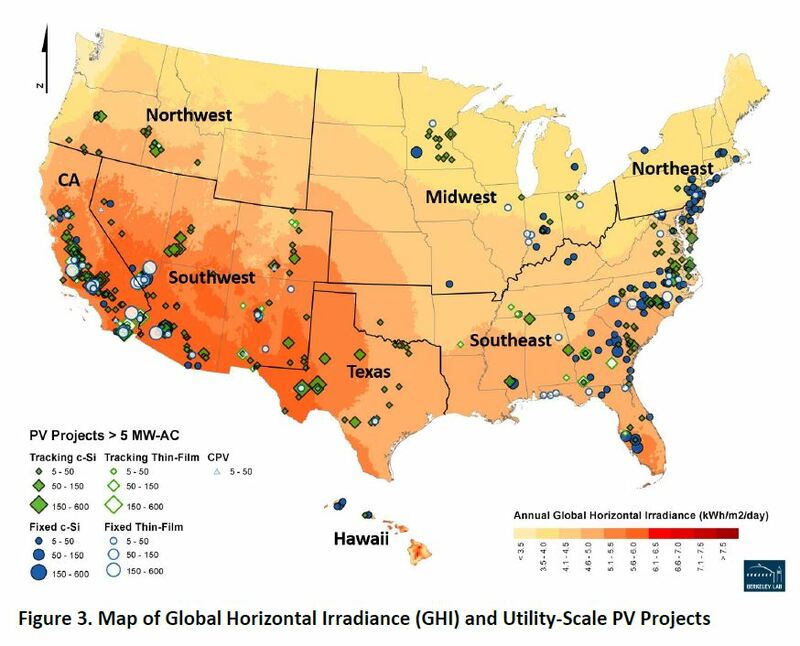 But solar installation has continued to boom throughout America, as mature markets such as California, which boasts 18,296MW of solar, have slowed while younger markets in the middle of the country are continuing to grow. Solar is growing at speed in some states, including Utah, Arizona and Nevada, and looks set to continue this trend through this year and beyond. This is predominantly due to the dramatic reduction in the cost of solar, which has fallen by as much as 85% since 2009. The drop has made solar installations cost competitive with natural gas in many of the sunnier states. In March, a vast solar project was launched in Pavagada, southern India. When completed the plant could well be the largest solar project to date as it will span 13 acres and produce 2,000MW – enough to power 700,000 households. This is just one of many new super-sized solar projects that are springing up throughout the sub-continent. India’s energy transition has been almost as dramatic as China’s, overtaking Japan in 2017 to become the third-biggest market for solar power. Prime Minister Narendra Modi is aiming to reach 100GW of solar energy capacity by 2022, which would be thirty times as much as in 2015. The country has ambitious goals, and with its quickly growing economy and large percentage of the population still living without power, solar has a lot of potential in India. It currently accounts for about 5% of the energy mix, but 14 solar parks have already been approved for construction and 22GW of solar power are expected to be added to the grid by the end of this year. Germany has the greatest solar power capacity of any European country, boasting 40.9GW in 2016 and with plans to continue to build its solar fleet. While Germany is more commonly associated with wind power, solar is expected to continue playing a significant part in the country’s Energiewende, or ‘energy turnaround’. Germany is pursuing an increasingly diversified energy sector with increases in technologies such as wind and solar allowing it to run off of 85% renewable for a day in April 2017. The country is aiming to fulfil about 200GW of energy demand with solar in the future, with annual instillations of 6GW-7GW required to meet this target. If this is achieved, however, Germany could become 100% reliant on renewable energies for its power. Despite its small size in comparison to many of the other solar success stories, as of 2016 Japan had an impressive 38.7GW of solar power capacity. Following the meltdown at the Fukushima Daiichi plant and the resultant shutdown of the majority of its nuclear power plants, Japan has become increasingly focused on renewable energy to ensure it will not remain reliant on expensive fossil fuel imports. This drive towards renewables has led to several new solar projects, increasing the share of solar in Japan’s energy mix to 4.3% by 2016. It is currently the fourth-biggest solar market and despite being overtaken by India continues to boom. In March, the largest floating solar plant in the world officially opened in Japan. The Yamakura Dam reservoir in Chiba Prefecture has a capacity of 13.7MW and was a joint venture between Kyocera and Tokyo Century, an organisation established in 2012 to promote the construction of major solar projects in Japan. While northern African countries have steamed ahead with solar technologies, in particular concentrated solar power (CSP), sub-Saharan countries have struggled to make the most of the vast resource. But this is slowly changing, with projects both big and small popping up across the continent helping bring reliable and sustainable energy to more people. 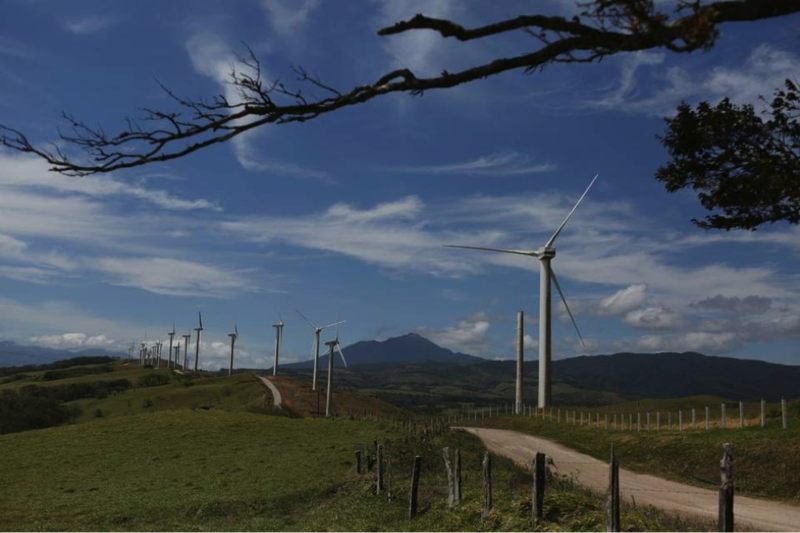 South Africa is one of the many countries that has thrown its weight behind renewables, predominantly wind and solar. It has now committed to an Integrated Resource Plan to diversify and strengthen its energy mix between 2010 and 2030 , which includes the goal to achieve 9,600MW of solar power capacity. Already there are a number of large solar plants in South Africa, such as the KaXu Solar One plant near Pofadder in the Northern Cape Province of South Africa. The 100MW CSP plant produces enough power to supply 80,000 homes and offset 315,000t of CO2 emissions a year. As of 2016, solar power was providing 1MW of power to the national grid in South Africa. This has already helped improve the notoriously unreliable power supply, and is set to improve it further over the coming years as the resource plan is implemented. Ta’u in America Samoa became 100% reliant on solar power for electricity in 2016. The idyllic island uses 5,000 solar panels and 60 Tesla solar packs to provide a reliable and clean source of power to its 600 residents. Ta’u is one of a few island nations around the world taking advantage of renewables, including Tokelau, a set of three tiny islands between New Zealand and Hawaii which has also made the switch. Islands such as these are some of the most at risk from rising sea levels caused by climate change, a sure encouragement for many to make these dramatic shifts to reduce their CO2 emissions. Ta’u’s diesel supply was often affected by bad weather, leaving generators short and electricity unreliable. For years, the main island in American Samoa Tutuila has had to subsidise shipments of 100,000 gallons of diesel, costing as much as $400,000 a year. It took two years to construct the microgrid on Ta’u, and despite some struggles getting it up and running, it has been a success. Although Ta’u is only small, it is an example of solar success and is being used as a pilot project for the rest of American Samoa, which is aiming to transfer to 100% solar power by 2040. In April 2015, I wrote an article for our newsletter entitled “How you can help make Florida the Sunshine State again.” At the time, Floridians for Solar Choice, a coalition of solar advocates was seeking signatures on a ballot petition to expand solar power in the State of Florida. I volunteered and participated in obtaining these important signatures. The petition’s focus was to increase solar choice by allowing customers the option to power their homes or businesses with solar power and choose who provides it to them. To get the initiative on the ballot, Florida required the coalition to first collect over 68,000 signatures of registered voters, and then have the initiative language approved by the state Supreme Court. This amendment failed to get on the November 2016 ballot due to being stymied when the utilities conducted a price war over petition gathering and they ended up in federal court suing their petition gathering vendor over billing practices. This proposal is now intended for the 2018 ballot. If passed, it will allow property owners to sign lease agreements with solar companies to finance and install equipment, a financing vehicle available in most states. Solar owners would then be allowed to generate and sell solar electricity to contiguous property owners as well as to area utilities. Currently, there are two solar power amendments that will be part of our Florida elections this fall. Even as a person involved in sustainable building and design as well as a solar power supporter, I was unclear about the content and ramifications of Amendment 4 and Amendment 1. My hope is that this article will help clarify the amendments and lead to informed voter choices. 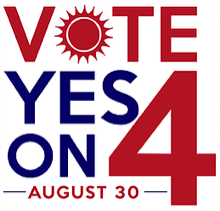 Amendment 4 will be on the August 30th Florida 2016 Primary Election Ballot. It is officially titled “Solar Devices or Renewable Energy Source Devices; Exemption from Certain Taxation and Assessment.” Explanation: If you were to install solar panels on your property, the value would be exempt from both the tangible personal property tax and the real property tax. It also creates a new exemption for businesses, appraisers would exempt the renewable- energy from the ad-valorem tax levied on the tangible personal property of a business. Amendment 4 was put on the ballot by the Legislature, with unanimous votes in both the Florida Houseof Representatives and the Senate. The following is an editorial by the Miami Herald Editorial Board printed on August 9, 2016. This editorial will help to understand the history and issues of solar power in the State of Florida and perhaps provide clarity for your vote. This is the Sunshine State. However, the use of solar energy — dependent on sunlight, which we have in abundance, and not on nuclear or fossil fuel — is still sporadic and contentiously debated. Cost and who profits almost always play central roles. 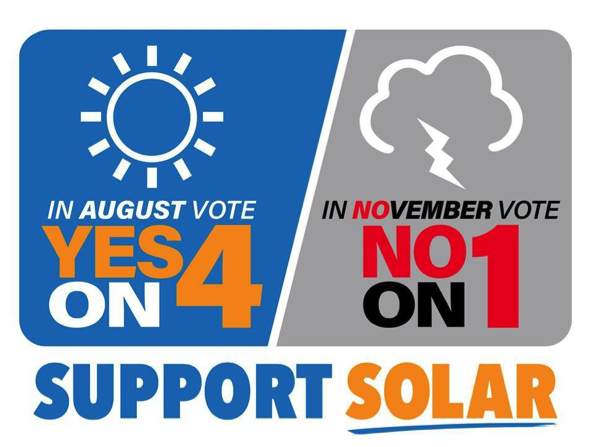 But unlike the controversial solar consumer-rights amendment on November’s ballot, in the primary on Aug. 30, Florida’s voters can approve an almost universally supported constitutional amendment that will reduce the cost of installing solar panels — more incentivizing, less punitive. The biggest barrier to solar panels is the upfront cost. Even though the cost of solar-panel installation has been dropping, it still is an expensive endeavor for many property owners. Amendment 4 would provide a tax exemption that makes it less costly to go solar. It would extend a tax break for residential property owners who have installed solar or equipment for other renewable energy since Jan. 1, 2013. This measure will allow Florida to get closer to realizing the full potential of solar energy. Consumers can trim energy costs; encourage energy independence and tamp down on fossil fuels’ contribution to climate change. According to the U.S. Department of Energy, Floridians use 40 percent more electricity than the national average. No surprise there, with air conditioners running almost year-round. So, yes, we can do much better. Unlike other constitutional amendments, placed on the ballot through petition drives because state lawmakers preferred to punt rather than take legislative action, Amendment 4 reached the ballot via a unanimous vote in the Legislature. The state cannot abate local taxes without going through the Florida Constitution. Lawmakers, this time, were following mandated process. And Amendment 4’s backers are a wide-ranging bunch, including, according to the League of Women Voters of Florida — itself a supporter — The Nature Conservancy and the Florida Tea Party; The Sierra Club and the Florida Chamber of Commerce. 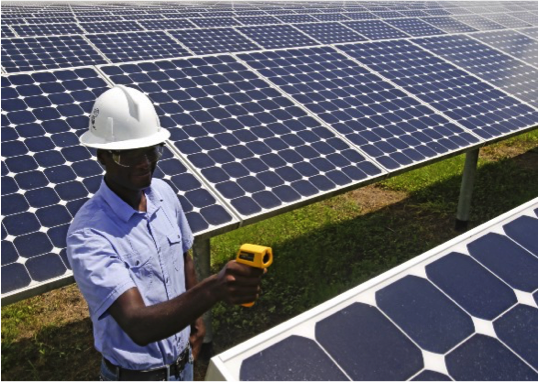 Amendment 4 not only would expand the use of clean energy, beneficial for Florida’s singular environment, it would add to the 6,500 solar jobs currently in the state and strengthen the economy while lowering solar consumers’ energy costs. The Miami Herald recommends YES on Amendment 4. Below are links to organizations that have information on Amendment 4 and Amendment 1 so that you can be an informed voter. Spread the word on Amendment 4; Urge people to vote YES on August 30th! As a result of our collective efforts, lawmakers and other coalition partners helped place a solar tax abatement amendment on Florida’s 2016 Primary Election ballot. This initiative would remove a barrier to solar by exempting the panels and other renewable energy equipment from property taxes for 20 years. If passed in August, this policy will lower the cost of solar, increase clean energy jobs, and greatly expand solar development across the state! Vote YES on August 30th! Say NO to the utility-backed ‘solar’ petition this fall: Amendment 1 is an effort by big monopoly utilities to choke-off rooftop solar and keep a stranglehold on customers by preventing them from generating their own power. In March, the Supreme Court narrowly ruled 4-3 to allow the utility-backed petition on to the November ballot. The utilities may have more money, but they are on the wrong side of this issue. We need you to fight alongside us and urge your friends, family and neighbor: VoteNO in NOvember! Florida is undeniably sunny. 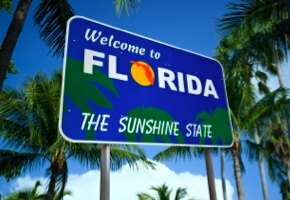 “The Sunshine State” was adopted as the State Nickname in 1970. It is used on motor vehicle licenses, welcome signs and marketing campaigns. While Florida promotes itself as the Sunshine State we are not utilizing our most abundant and natural resource, solar power. What is solar power? It is energy from the sun that is converted into thermal or electrical energy. Solar energy is the cleanest and most abundant renewable energy source available. 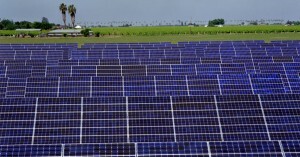 The U.S., including Florida, provides some of the richest solar resources in the world. Only two other states, California and Texas, have more rooftop solar power potential than Florida, according to the U.S. Department of Energy. Based on Florida’s size, rebounding economy and growing population our state should be a leader in the generation and promotion of solar energy. So why isn’t Florida a solar energy leader? The reason is simple: Florida’s large utility monopolies and lawmakers have worked successfully to block and control who can generate solar energy and what it can be used for; thereby restricting its use by homeowners and businesses. Florida utility monopolies exist today due to a law that was created over 100 years ago which was trying to avoid a tangle of power lines strung up by competing companies. This same law restricts solar companies from installing solar panels on roofs and selling back electricity. It is considered a third party sale and is illegal in Florida. Florida is now only one of four states in the nation that prohibit citizens from buying electricity from companies that will put solar panels on a building. Due to the influence and power of Florida’s utility monopolies, there is a large effort to discourage renewable energy in the state. The large utilities are afraid of losing their monopoly and the lucrative profits that the government guarantees them. Recently lawmakers, at the direction of the utility companies, gutted the State’s energy savings goals and entirely eliminated Florida’s solar-rebate program. Floridians should have access to solar power and free market choices. We should be allowed to contract directly with solar providers to power our homes and businesses with solar energy. We are currently being denied the right to choose solar as a power source. The free market and competition benefits all of us. Solar energy makes financial sense. That is why business leaders in America’s brightest, most competitive companies are increasingly choosing to install solar energy systems at their facilities. 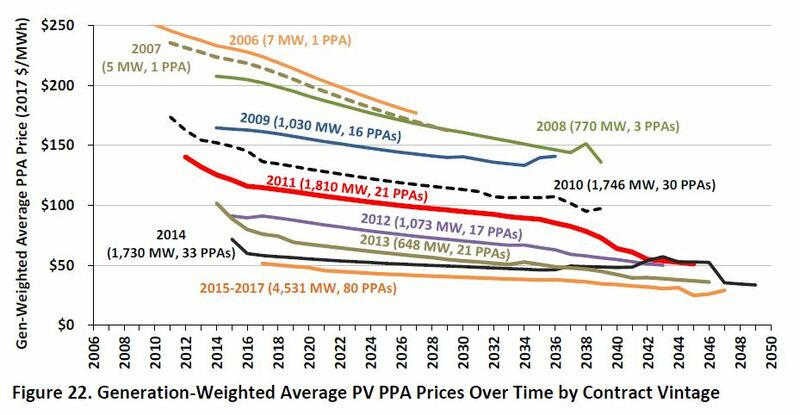 The price of solar energy has fallen dramatically over the past few years while the price of fossil fuel generation continues to experience volatility. America’s businesses are turning to solar power because it’s good for their bottom line. According to a report by the Solar Energy Industries Association, Walmart is the top corporate user in the United States with 105 MW installed at 254 locations. 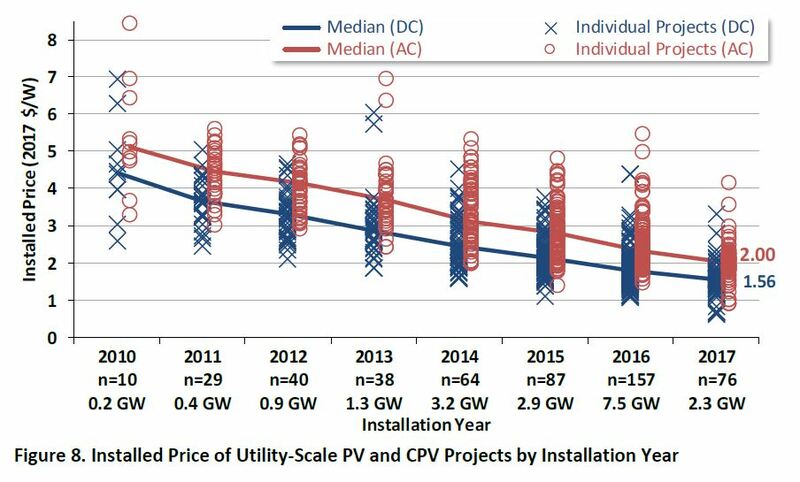 The average price of an installed commercial PV (photovoltaic) project in 2Q2014 was 14% less than the cost in 2013 and was over 45% less than it cost to complete in 2012. Electricity costs represent a significant operating expense, and solar provides the means to reduce costs and hedge against electricity price increases. The Solar Means Business report noted that the top 25 companies for solar capacity had more than 569 MW of solar PV at 1,110 different facilities in a survey conducted last August. These results represent a 28% increase over the prior year and a 103% increase over 2012. The Florida resident-led solar group, Floridians for Solar Choice, is seeking to make solar more accessible in the state. They are seeking your signature on a ballot petition. The petition seeks to expand solar choice by allowing customers the option to power their homes or businesses with solar power and chose who provides it to them. Floridians for Solar Choice have reached 72,000 signatures on their petition which clears the way for it to be reviewed by Florida’s Supreme Court. The Supreme Court will decide whether or not the petitions language legally qualifies it to be a ballot initiative for Floridians in 2016. 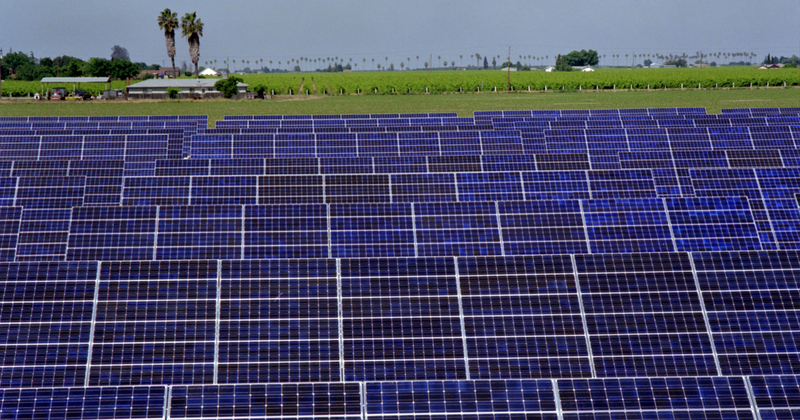 Getting its petition on the 2016 ballot is the main goal for Floridians for Solar Choice. They need over 600,000 more signatures to have this critical citizen initiative to be put on the ballot for next year. Please visit their website to learn about the solar initiative to remove this legal barrier to making Florida the Sunshine State again, and, more importantly, to sign the petition, go to: www.FLsolarchoice.org. The 2014 Sustainia Awards, chaired by Arnold Schwarzenegger, attracted more than 900 submissions for projects and technologies representing 10 different sectors from food, fashion and, city development to transportation and healthcare. Collectively, these projects are deployed in more than 84 countries. The runners up for the award are showcased here and the winner will be announced in Copenhagen on Thursday 30 October. The ceremony will celebrate these innovations ahead of the release of the Intergovernmental Panel on Climate Change’s (IPCC) anticipated report on climate change, due to be finalised 31 October. Netafim is behind a low-tech irrigation system for smallholder farmers in developing countries which increases and secures yields while saving water and cutting costs. It drips precise quantities of water and nutrients right at the root zone of crops while an elevated tank distributes the water using gravity. This minimises the need for electricity and investments in infrastructure. The UN estimates that 500 million smallholder farmers provide over 80% of the food consumed in the developing world. Irrigation systems are vital to sustain agriculture as it addresses water scarcity and soil erosion. The solution is commercially viable with a payback-time of about a year, making it fit for microfinance projects. As a mode of transport, the bicycle is one of the lowest emitter of greenhouse gases – even with the CO2 emissions of the food you need to power a bike. This helps explain why bike-sharing systems are being adopted increasingly by cities. The Spotcycle app from 8D technologies aims to make bike-sharing more convenient and smartphone-friendly. The app locates nearby bike stations and communicates availability, maps out bike paths and helps with navigation. The app is already in sync with cities in North America, Australia and Europe. Air conditioners use about 5% of all electricity produced in the US. As a result, 100m tons of carbon dioxide are released each year. Advantix’s air conditioning system uses saltwater which means it needs 40% less energy than normal systems. Whereas air-conditioning systems normally chill the air to remove humidity and then reheat it in a highly energy-intensive process, Advantix’s air-conditioners funnel the air through non-toxic fluid saltwater instead. The process dehumidifies the air without the need for re-heating. Clothes are often discarded after the first or second life cycle, and apparel accounts for up to 10% of a western consumer’s environmental impacts. Through an advanced take-back system, I:CO works to keep apparel, footwear and other textiles in a continuous closed-loop cycle. Used shoes and clothing are collected in stores and retail outlets, where customers are financially rewarded for depositing their used items. Once collected, the textiles are sorted according to more than 350 criteria for designation. Used clothes can be labeled suitable for: second-hand sale, recycling into fibres and paddings for new products, or upcycling. Through development, design and production, social enterprise Fairphone works to create positive social impact in the consumer electronics supply chain – from responsible mining, decent wages and working conditions to reuse and recycling. Fairphone began by redesigning the processes behind the production, making phones that use conflict- free minerals and are assembled in a factory with a worker-controlled welfare fund. To date, Fairphone has sold nearly 50,000 phones from its first two production runs. Preventable causes related to pregnancy and childbirth claim 800 lives daily and 99% of cases happen in developing countries. We Care Solar has created a sustainable solution. The Solar Suitcase provides solar electricity for medical lighting, mobile communication and essential medical devices for rural areas and humanitarian settings. This enables safe and timely obstetric care, which ultimately improves maternal and neonatal outcomes. Additionally, the innovation allows emergency surgeries to be conducted around-the-clock in rural hospitals. The Solar Suitcase has been introduced to more than 600 healthcare facilities in 20 countries. In Lagos, Nigeria, Wecyclers is fuelling social and environmental change by enabling people in low-income communities to make money from unmanaged waste piling up in their streets. It is a response to the local waste crisis; the municipal government collects only 40% of city garbage. The Wecyclers initiative has deployed a fleet of cargo bicycles to pick-up, collect and recycle garbage in low-income neighbourhoods. Families are encouraged to recycle their bottles, cans and plastics through an SMS-based programme. For every kilogram of material recycled, the family receives Wecyclers points on their cell phone. Families can then redeem points for goods such as cell phone minutes, basic food items or household goods. 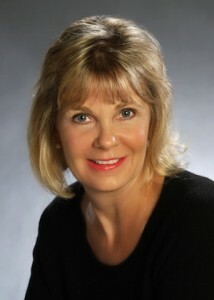 The initiative adds to the local economy by hiring personnel locally. With its novel technology that converts greenhouse gases into plastic material, AirCarbon has disrupted the market by replacing oil-based plastics with a sustainable product that is competitive in both price and performance. It is made from a process where carbon in the air is captured and used in manufacturing. AirCarbon uses pollutants as resources to make products otherwise made from oil. Products made from AirCarbon are carbon-negative even after calculating the emissions from the energy used in production. AirCarbon is currently used to make chairs, bags and cell phone cases. More than one million Bangladeshis could be displaced by rising sea levels by 2050. One consequence is that children cannot attend school for long periods of time, making it harder for them to escape poverty. By building a fleet of solar-powered school boats, the Bangladeshi initiative Shidhulai Swanirvar Sangstha has secured year-round education in flood-prone regions of Bangladesh. Each floating school boat collects students from different riverside villages, ultimately docking at the last destination where on-board classes begin. Solar lighting makes the schedule flexible, which provides for additional educational programs in the evening. Shidhulai’s floating schools model has been replicated in Nigeria, Cambodia, Philippines, Vietnam and Zambia. Through use of big data, Opower has given energy utilities a new way of engaging with customers in order to improve energy efficiency. The software solution combines cloud technology, big data and behavioural science to produce data analyses and personalised information on how to save energy. To motivate reductions in energy consumption, utilities use Opower to share money-saving insights with custumers. Opower can also show households their energy usage compared to neighbours; an effective method in motivating people to save energy. Opower has enabled savings of over 4TWh of energy, which is equivalent to $458m (£283.1) in bill savings.